Whenever there is a new book released, I always hope to find some Thames references. Well, Jane Tolerton's new book is full of surprises. 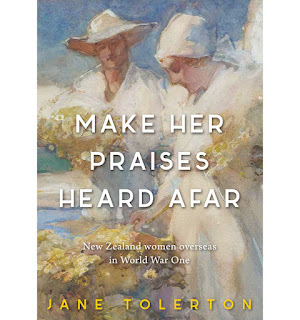 Make Her Praises Heard Afar, New Zealand women overseas in World War One has just been released and covers the women from New Zealand who have previously been overlooked in World War One. Women with a connection to the Thames area, who get a mention in the book are: Cora Anderson, Mary Barkas, Theresa Butler, and Emma Harris. The highlight are the letters that Mary Barkas wrote to her father back in Timaru. Mary was 25 and had gone to London to attend the London School of Medicine. With friends, Mary Barkas was travelling around Europe before the war broke. The following are quotes from "Make Her Praises Head Afar." Monday 3 August: "A week ago nobody dreamed that a great European War was possible...Now, in only four days, it seems that all Europe is on fire." Thursday 6 August: "The German People seem to be enthusiastic and talk about the righteous cause"
Tuesday 11 August: "Here we are in the midst of War, and apparently likely to stay here for some time. Tonight comes the news of a big German victory." Thursday 27 August: "Our special train is to go tomorrow...Last night Marjorie wrote obituary notices for us all in case we get blown up in the Channel." Mary and her friends went by train to France, then crossed the English Channel on a crowded ship. "A month after the outbreak of war between Germany and France when Mary finally arrived at the flat she shared with her mother." Dr Barkas completed her medical training and then moved into the field of Psychiatry. You may well ask, how does this person have a connection to Thames? After her father died in 1932, Mary came back to New Zealand and instead of returning to England, settled on the Thames Coast. Dr Mary Barkas, is a name that is still well known amongst older Thamesites to this day. Dr Barkas was a world renown psychiatrist; and during her time on the Thames Coast she was also the first in New Zealand to breed Schnauzer dogs. 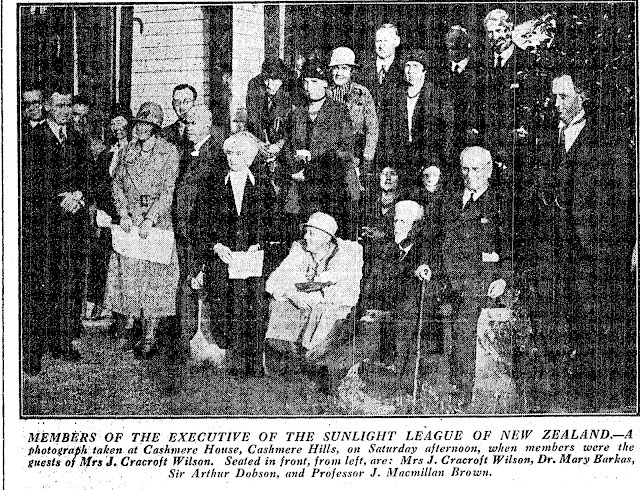 Mary was an active member of the community, for instance in 1937 she was a member of the Tapu Branch of the New Zealand Labour Party. During World War Two, Dr Barkas helped establish emergency training services in Thames and gave lectures in all levels of home nursing to the people of Thames. Little did the people of Thames and Coast know, that they had such a famous person in their midst. Someone who had studied psycho- analytical methods from a pupil of Dr Freud himself. Her papers were published widely and she attended many conferences. Considered a true pioneer in the field of Psychiatry and a pioneer for women in this branch of medicine. Dr Mary Rushton Barkas passed away at Thames Hospital 17 April 1959, her funeral was held at the Thames St George's Anglican Church; Dr Barkas was cremated at Purewa Crematorium in Auckland on 20 April 1959.